← Does it hurt when you read this? 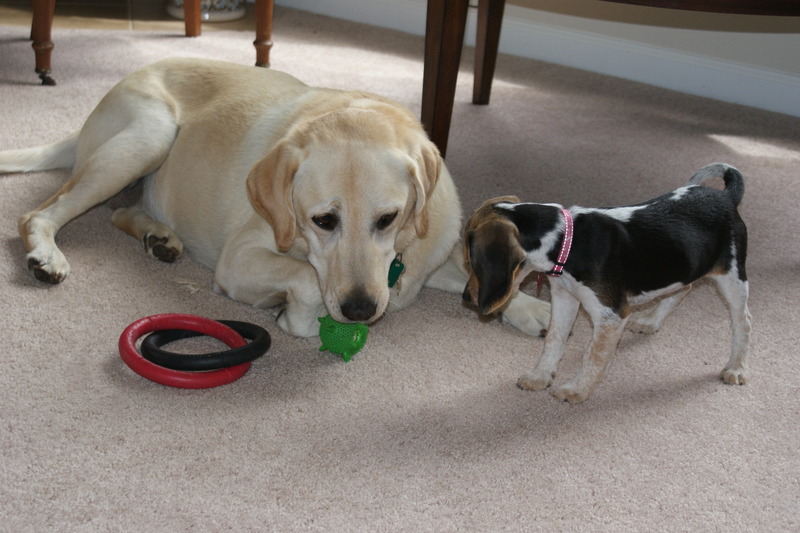 We were dog-sitting our friends’ beagle puppy (Daisy) this weekend. 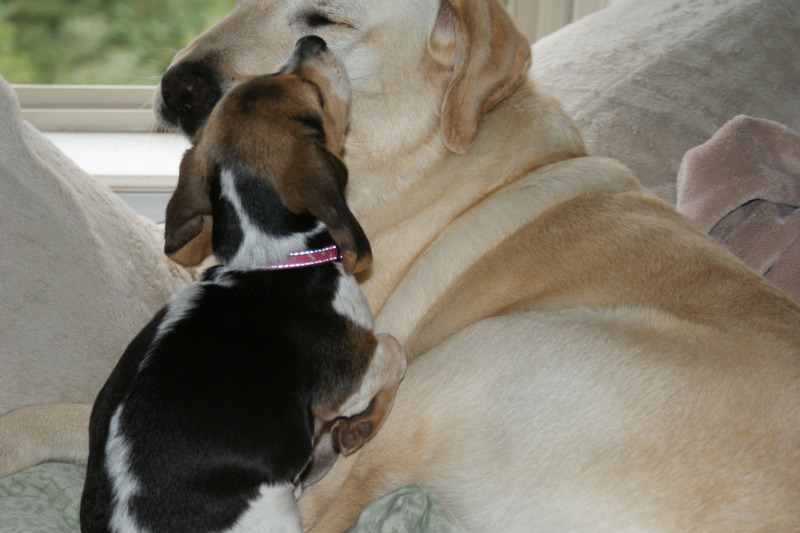 Our Yellow Labrador (Queenie) helped us. I could swear they were talking to each other at times. Perhaps you’d like to listen in. "OK, quick quiz youngster, this knot is A. a Granny, or B. a Half-hitch, or C. a Square?" "Go ahead, punk. Try to take it. Make my day!" (Whispering) "Queenie, you promise you won't tell another soul?" "If we just put our heads together we can figure this out!" "Take a rest Queenie, I got your back."." "Daisy, I don't think this is what they mean by bringing up the rear." "Well, you did say you'd keep an eye on me this weekend, didn't you?" 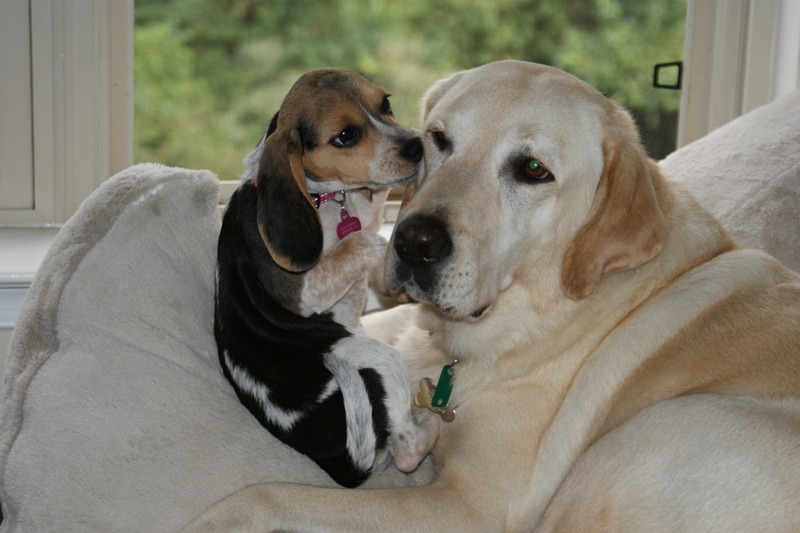 "Daisy, that 2nd molar on the left hurts a little, do see any decay?" 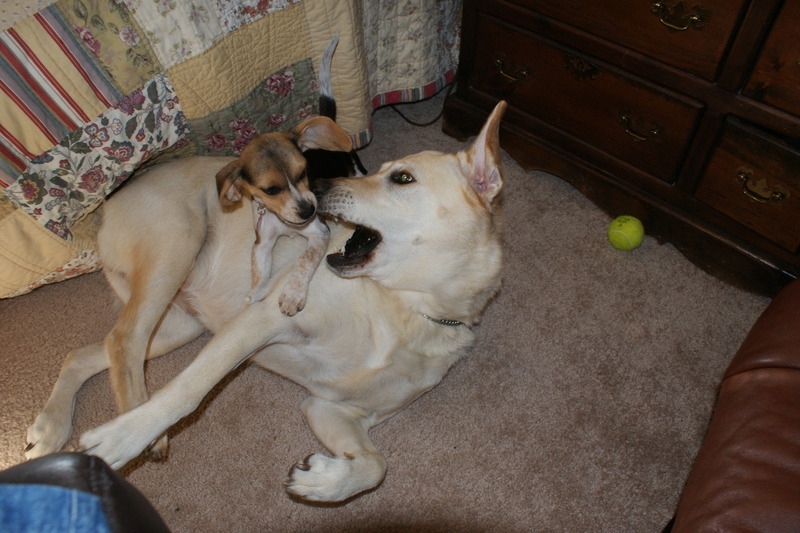 "This is my vicious German Shepherd impression. Pretty good, huh?" "Oh yeah, wait til you see my Dumbo impression!" "A little more to the left... a little more.... ahhhh....that's it!" "So this is what you meant by being at the end of your rope." "I said, look at me when I'm talking to you!" 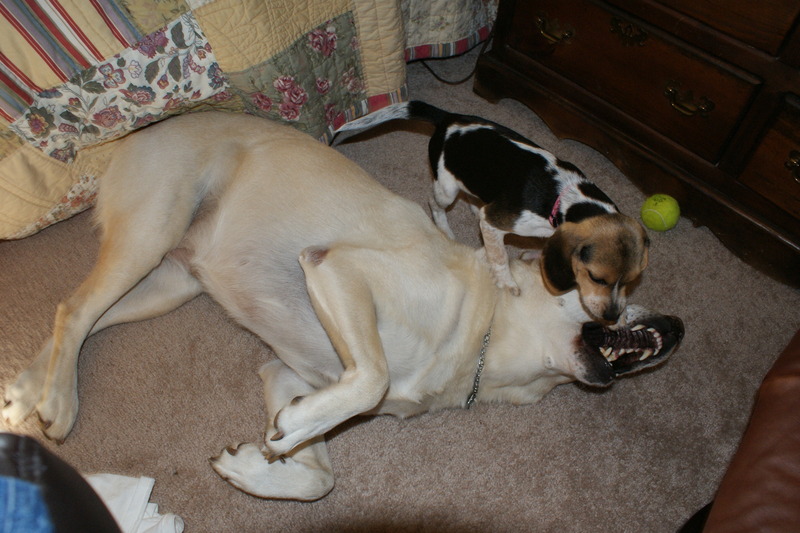 "Trust me Daisy, this "head in the mouth of the Lion" trick wows 'em every time!" Eat your heart out Dr. Doolittle. 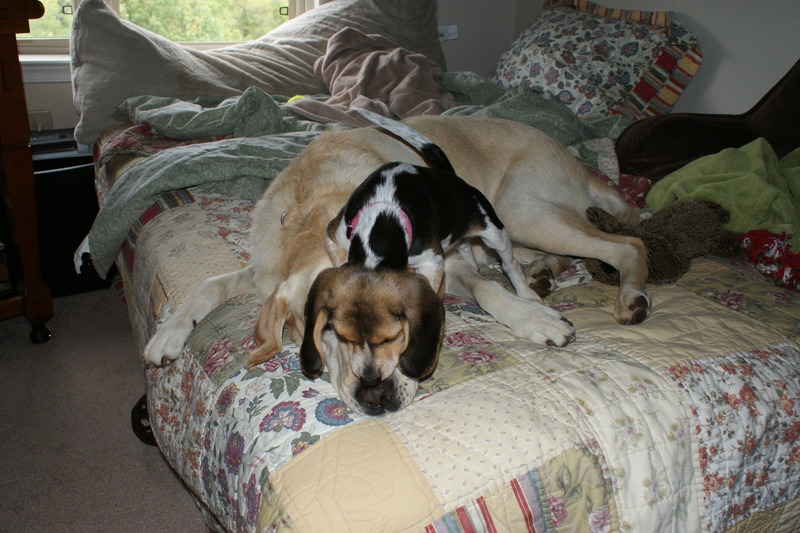 This entry was posted in Humorous and tagged Beagles, Dog, Labrador Retriever, Pets. Bookmark the permalink. 24 Responses to Conversations overheard….. They were a laugh a minute. We laughed at them so much this weekend our faces were sore. Glad you enjoyed it too. Al, I’m impressed. The longest conversation I’ve had with Scrappy had to do with pooping and it was more or less one-sided (the conversarion, I mean). Great way to spend a weekend and your inner shutterbug! Very familiar with those conversations too, Lorna. And you’re right, they’re more like monologues and with the colder weather coming, they will become more vociferous. Awwwwwww. 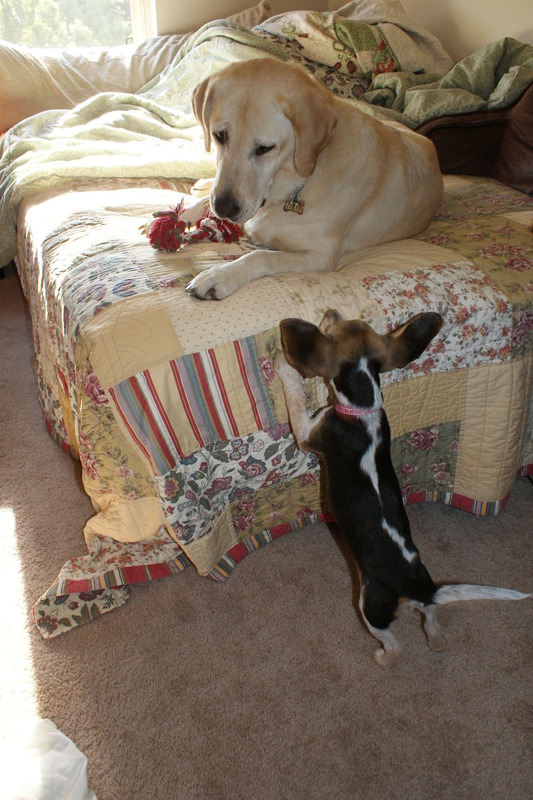 I can’t believe how patient Queenie is with that puppy. Too cute! Queenie has always been a laid back pup. 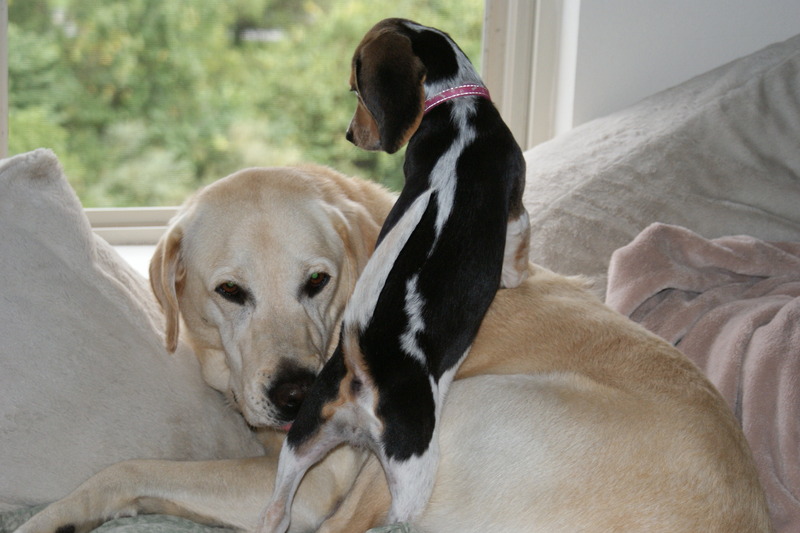 Since she never had puppies maybe she thought this was her chance at motherhood. What adorable pictures. 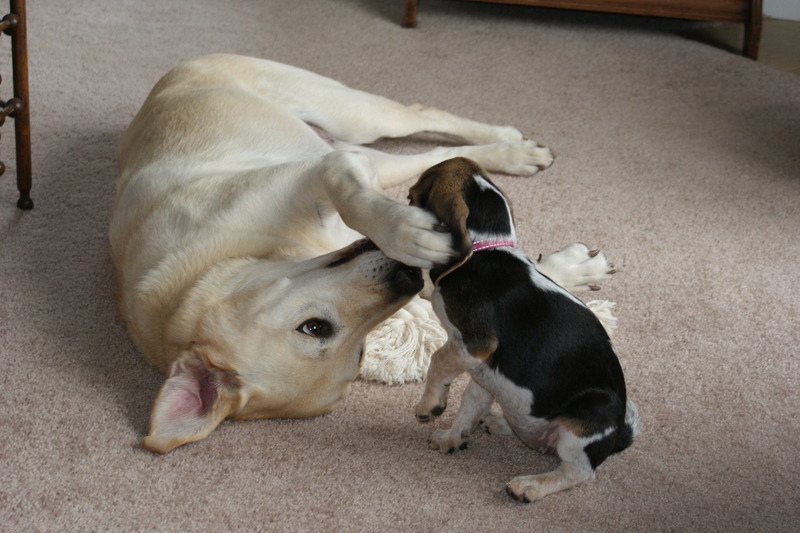 You probably couldn’t concentrate on football watching because the dogs were so engaging. I didn’t need to. Most of the blocking and tackling took place in the living room. Thanks egills. When they are that young they are all ears! Yay Big Al!!! Thanks for doing a dog post. 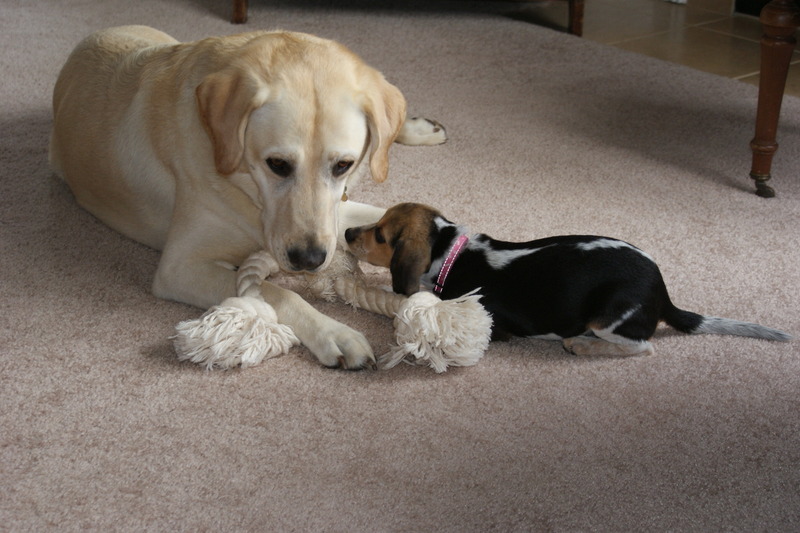 I love Queenie and that little Daisy is adorable (I love beagles and labs, how can you go wrong?) 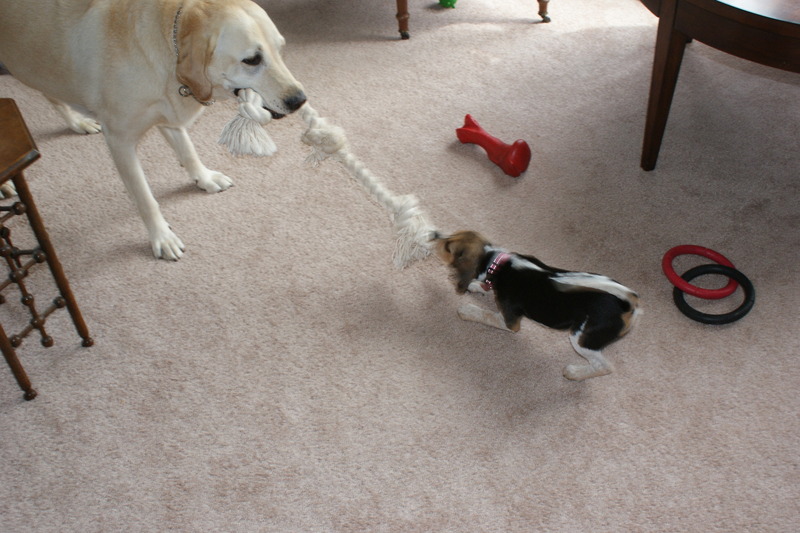 I can’t believe that tiny puppy played tug with a full grown lab. Puppies are amazing. I knew you would enjoy it Jodi. They were cheap entertainment, for sure. 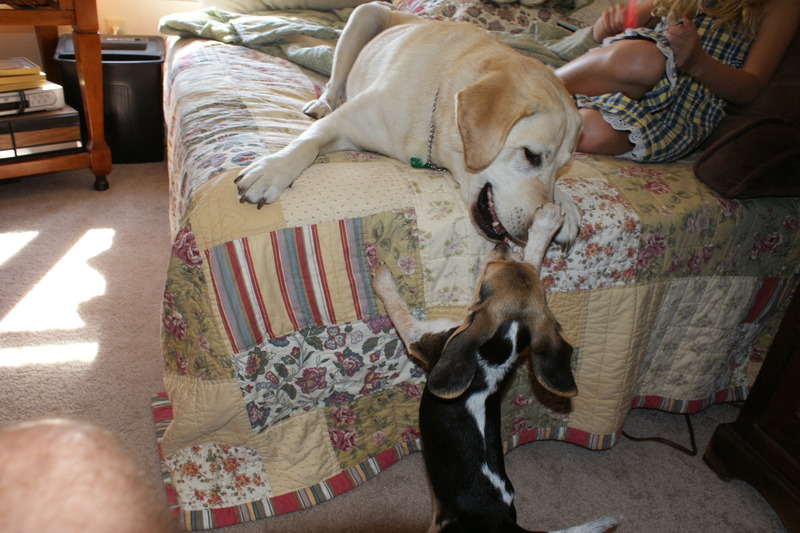 I’m glad you said I could enlarge these…they’re even better that way…especially that last one where I thought Queenie was considering having the beagle for lunch…nah, she’s a lady! You had fun last weekend, huh. Great photos. Yeah, like Hannibal Lecter said in “Silence of the Lambs”, she was having a friend over for dinner. We did have a blast. It seems so quiet around here now. It was tough. Queenie looks depressed. IS BIG AL CLEVER! No it’s the dogs that are the clever ones..they told him what to write.. 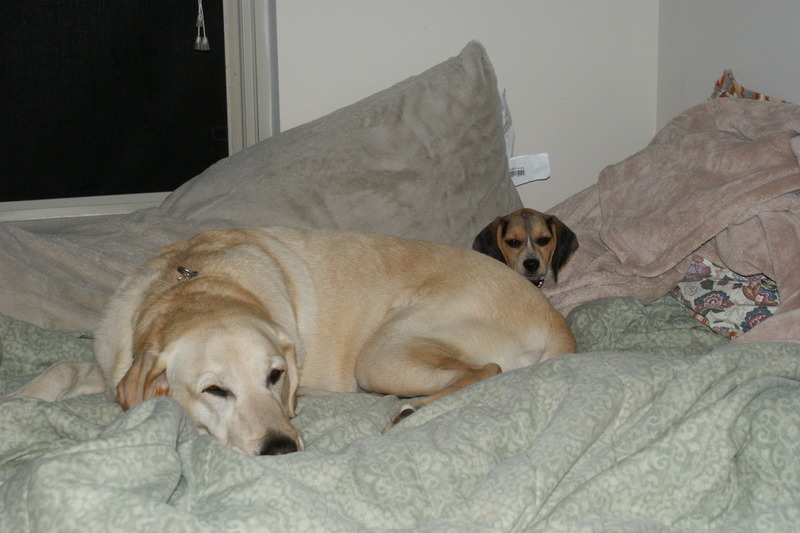 I got a funny feeling they were plotting against me the whole weekend. Too damn cute for words! this is wonderful! You are so clever! 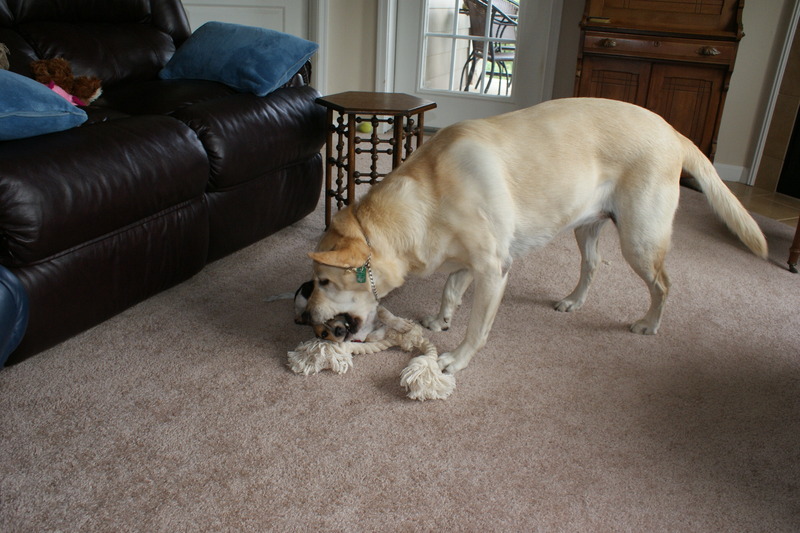 Queenie was mauled almost continually. She is so patient. She gave herself up to save our fingers ans toes.